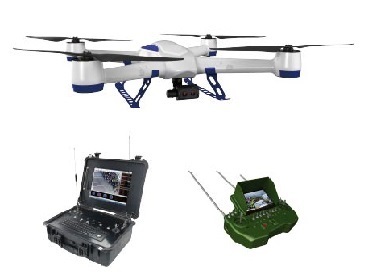 Intelligent flight control, military-grade airborne equipment, excellent performance, light and reliable, silent flying, more convert and safer. Produced by professional manufacturer who has been engaged in developing and manufacturing wireless data transmission equipments, wireless video transmission equipments, intelligent control equipments and professional recording equipments for nearly 20 years, TS100 performs twice better than similar models. Integrated multi-rotor unmanned aircraft system, based on modular design, is able to change airborne mission equipment in order to meet different task requirements. With its fast growing, the infrared thermal imaging technology has been widely used in electrical power system, energy saving, civil engineering, electricity, automobile, metallurgy, petrifaction, medical treatment, security and other industries. The infrared imager is able to find faulty quickly and accurately before the object to be tested breaks down. Professional night vision camera has been widely used in video surveillance because of its hidden ability for recording at night. The swappable 100° and 30° degree of FOV Duo Camera allows the operator to magnify the viewing field when swapping from 100° to 30° camera, which is equivalent up to 4x optical zooming. Other Functions: Manual flight mode; real-time display of flight status; real-time display of remote sensing video; storage of real-time remote sensing video; airborne camera recording control; airborne camera preferences setting; 7 status checking; airborne camera holder preferences setting for recording control; head rotation; display of aircraft gesture, coordinate, speed, angle, power level; touch screen; one-click photography; one-click auto-hover; one-click return; one-click auto take-off (airline operation based on coordinate), one-click auto landing; one-click full-automatic flying; special function key; universal key of holder control; course and tail control switch; airborne camera; focus control; warning tone; low voltage warning of aircraft, low voltage warning of airborne camera; auto air route setting(airline operation based on coordinate), etc. Other Functions: Reversed function key; manual flight mode; real-time display of flight status; real-time display of remote sensing video; storage of real-time remote sensing video; airborne camera recording control; airborne camera preferences setting;7 status checking; airborne camera holder preferences setting for recording control; head rotation; display of aircraft gesture, coordinate, speed, angle, power level; touch screen; one-click photography; one-click auto-hover; one-click return; one-click auto take-off (airline operation based on coordinate or map), one-click auto landing; one-click full-automatic flying; special function key; universal key of holder control; course and tail control switch; airborne camera; focus control; warning tone; low voltage warning of aircraft, low voltage warning of airborne camera; auto air route setting(airline operation based on coordinate or map); airline operation mode; playback of saved video; time setting; auto take-off control; auto landing control; 3D orientation of map; 2D orientation of map; strong information processing function; flight height setting; flight destination setting, etc. Military reconnaissance, intelligence gathering, individual combat investigation, border patrol, etc. Regimental police, armed police, large-scale activities of security, traffic police, forestry public security, emergency rescue & disaster relief, customs, etc. Water conservancy, electric power, communication, transportation, territory, real estate, mining, industry, agriculture, geography, environmental protection, meteorology, expedition, training, hunting, etc.